The X-Files are back in a big way. The first episode of the forthcoming six-episode reboot aired Saturday at New York Comic Con, and judging by the sold-out crowd, X-Philes are back in full force as well. The premiere, which airs on January 24 after the NFL championship game on Fox, doubled-down on the mythology — and reunited Agents Mulder and Scully, who are no longer living together, but still cordial. In one of many loaded moments the duo shares, Scully tells Mulder that she’s “always happy to see [him].” So despite creator Chris Carter keeping them apart, rest assured, David Duchovny and Gillian Anderson do share plenty of screen time. Carter seemed particularly anxious for the screening, “It makes me very nervous,” he said during the post-episode panel. “I was wondering how everyone was reacting to it, how they’re enjoying it.” Fans hooted their praise in response, as they also did through the show’s original credits (which now seem vintage), and when Mulder and Scully first came on screen. 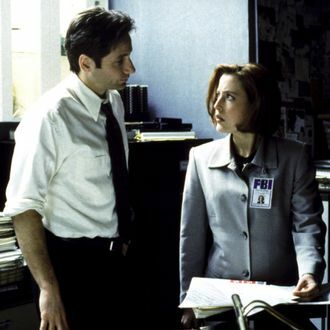 The premiere episode, titled “My Struggle” and written and directed by Chris Carter, lightly skims the agents’ decades-long relationship while digging deep on the alien abduction and government conspiracy that made the show so irresistible. Duchovny set the reboot wheels in motion. They know all about your Mulder-Skinner fanfic. Mulder and Scully aren’t together — but don’t say it’s because Mulder is hard to live with. When asked why the agents are no longer romantically involved, Carter quipped, “This is where the sniper gets me. I mean, they’re not living under the same roof and that was a conscious thing and we wanted to play to the passage of time, and Mulder and Scully had their difficulties, and that’s where we are.” He offered no further explanation, but when Nanjiani said “Mulder is probably a chore to live with,” Duchovny offered up a little side-eye (jokingly, we assume) in response. The Lone Gunmen are back. But not in the first episode. After being asked if the fan-favorite trio was returning, Carter himself confirmed, “The Lone Gunmen are back!” — a statement that received the loudest applause during the panel. The reboot is much more cinematic. Maybe it’s just because TV taste has changed and evolved so much since the show’s ending, but the premiere feels far more grand and epic — more reminiscent on a grand scale of the 1998 film Fight the Future — than any of the network episodes. And there’s a good reason. Carter recalled that before shooting, “David said, ‘We gotta come out and punch them in the mouth.’ We know we needed to make a statement and be bold.’” And it seems Fox allowed them the freedom — and the budget — to do so. The opening sequence distills nine years into a few minutes. Mitch Pileggi believes in aliens; Duchovny’s not so sure. Skinner’s character was based off Pileggi’s father. Don’t worry, the MoTW are back. There could be more episodes on the horizon.